Maker Faire: Striking a blow against consumer culture? I went to the East Bay Mini Maker Faire in Oakland today with a secret agenda. At Maker Faires I typically walk around and engage with exhibits and makers that catch my interest, but this fair was different. I came with my 9-year-old son and three of his friends. I wanted to follow them and see where their interests took them. 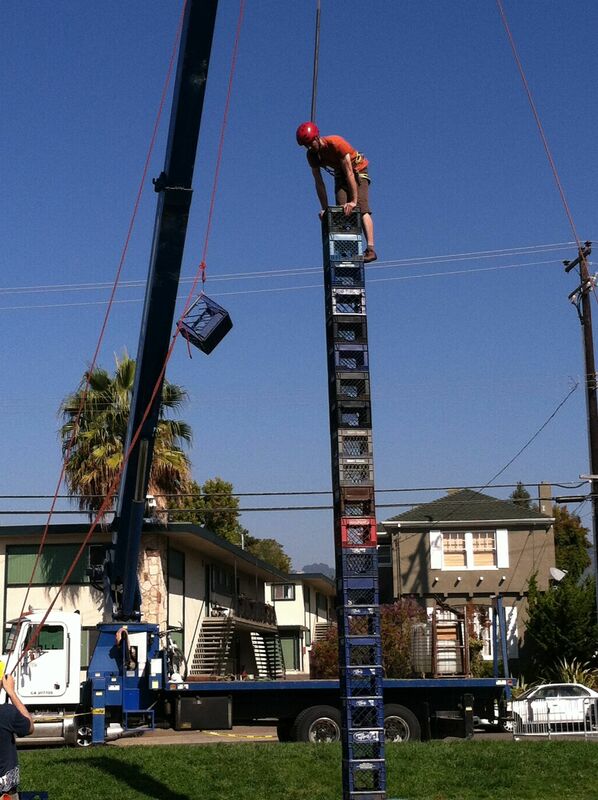 This guy stacked more than 20 milk crates before they all came tumbling down. They loved the milk crate stacking contest in which contenders stacked, stood, climbed on a precarious tower of crates while wearing a safety harness suspended by a giant crane. 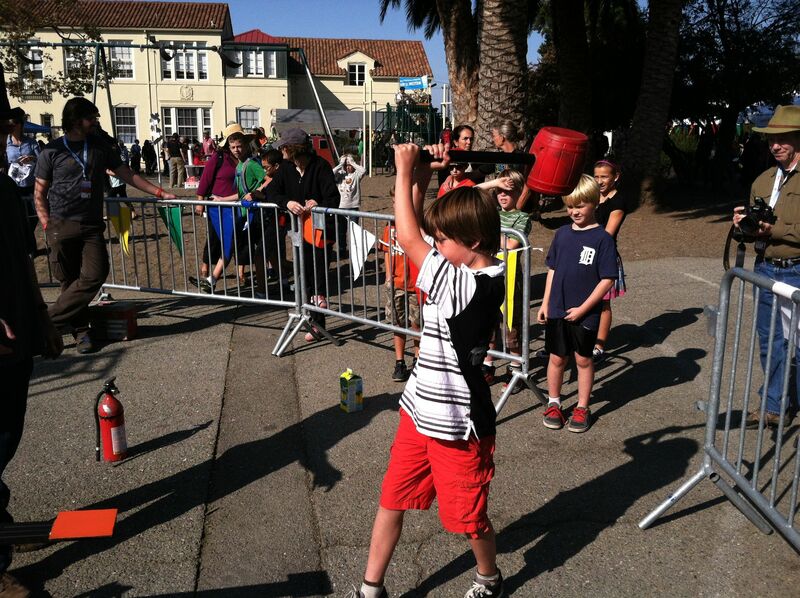 They were thrilled and a bit intimidated by the “high striker”, a twist on the carnival strong man game. Instead of swinging a mallet to ring a bell, the harder you swung the mallet the higher it emits a roaring flame. 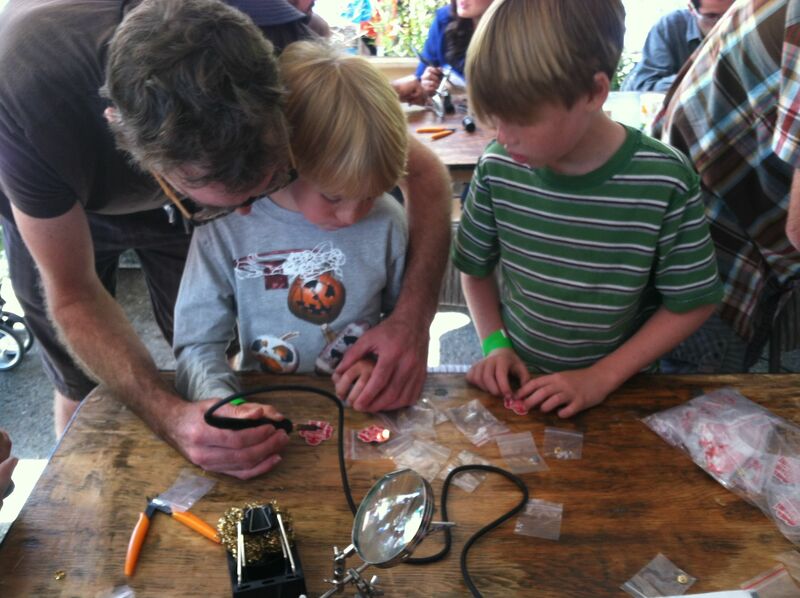 Two of my son’s friends grabbed a seat in the learn-to-solder tent and set about making robot badges with blinking LED eyes. My son wanted to make a sword, but was bummed when they ran out of supplies. He and his fellow 3rd grade friends are still young enough that a sense of wonder and play bubbled out of them, but I know the countervailing forces of consumer culture are close behind them and would rather have them buying things than making them. So my secret agenda was to bolster the maker spirit within them and fortify them against the forces of “buy, buy, buy” already vying for their attention. Makers are in a position to understand and change the world. Buyers of things need only know where to find what they want and have the money to pay for what they’re buying: acculturated knowledge. But makers of things know what things are made of, how they work, where they come from, what their real cost is, how to fix them. Makers are connected to the world because everything that is made comes from the world….I (have) come to believe that when all of life is for sale, it is a revolutionary act to become a maker of things. I like that last sentence. Are makers born or made? I say we’re all born makers. An intellect built for problem solving, creative expression, and tool making predisposes us for making. It’s part of what makes us human. Alas, we don’t all get the chance to explore making and for many more of us, the maker in us drains away, siphoned off buy a culture and economy that’s geared around consumption, convenience, and commodification. As a father I want the best for my son and his friends and I try to steer them toward activities and ideas that I think will enrich them. I came to the East Bay Mini Maker Faire with a revolutionary zeal. I sought to radicalize my son and his friends to the ways to making. Time will tell if it worked.